In 2014, a man walking on a beach in Gywnedd stumbled across what he thought was a 20-inch elephant tusk. In fact, it was a 3000-year-old horn of an aurochs (Bos taurus primigenius), a colossal type of wild cattle, and a reminder that here in Wales we tread in the footsteps of these incredible, ancient beasts. Now extinct, aurochs were the ancestors of domestic cattle, and standing up to 6 feet, were distinctive for their enormous horns that dwarf those of cattle today. In 1627, in the Jaktarow Forest in Poland, the last aurochs, a species estimated to be some 2 million years old, died of natural causes. 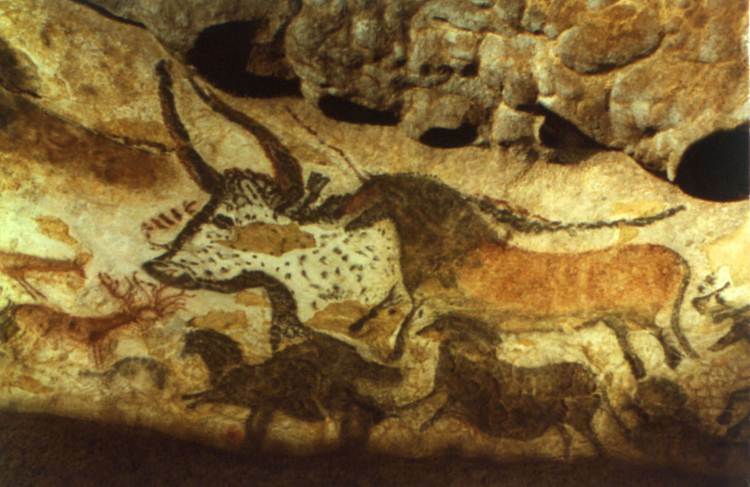 In ancient times the distribution of the aurochs was large, and it roamed over much of the Northern Hemisphere. Some scientists believe that these large herbivores were an important ‘umbrella species’, providing habitats for other species by maintaining a mosaic of landscapes, a mixture of open grassland and forest. Aurochs were domesticated around 9000 years ago, human selection took over from natural selection, and today over a thousand diverse variates of cattle are descended from them. Aurochs, both bull and cow, possessed reddish brown coats as calves. Cows’ coats remained red into adulthood, whilst bulls’ deepened to a blackish-brown. In males, an ‘eel stripe’ was present, a black, elongated stripe running the length of the spine. Their udders were small and barely visible, large udders common in cattle today being a product of selective breeding to improve milk yield. Hunting and habitat loss led to their eventual extinction, yet echoes of the lost aurochs abide in present day breeds; Holstein-Friesians have horns of the exact same form (though smaller), and Jersey cattle carry genes for the aurochs’ coat. Forgotten in the years following their extinction, there was a resurgence of interest in the species by conservationists and zoologists in the 20th century. Most famously, German zoologists Heinz and Ludwig Heck began a breeding programme that aimed to recreate the lost aurochs. They proclaimed themselves successful after only twelve years, but their new breed was merely a cow in aurochs clothing. Smaller, differently proportioned, their animal could not breed true and lacked the mighty horns of its wild ancestor. 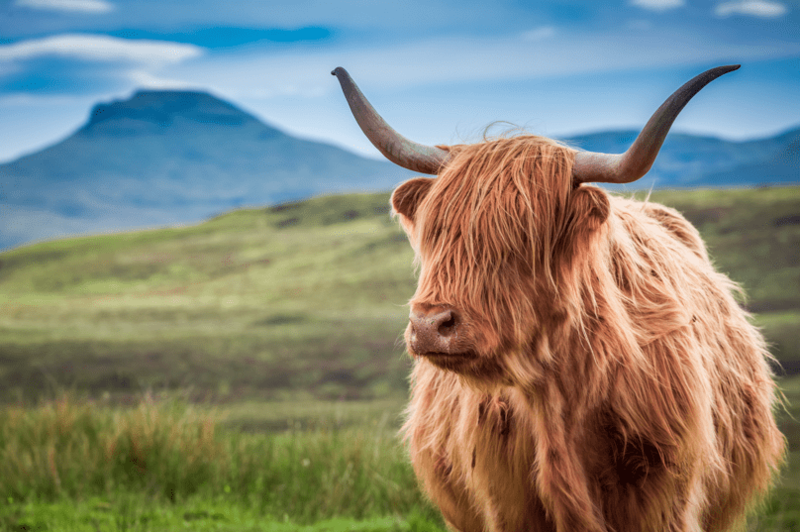 Though this attempt fell well short of reinventing the aurochs, scientific studies show that Heck cattle do indeed provide a viable substitute for conservation purposes, as well as an excellent foundation for further breeding programmes. The Tauros Programme is a European project that works with genetic scientists and aims to further close the gap between modern breeds of cattle and the wild aurochs genetically, physically and behaviourally; an imitation of the original to provide the missing link of large grazers in the European ecosystem. Other conservation projects around the globe are experimenting with large bovines, predicting that reintroduction of non-domestic large grazers will help to effectively manage land with little human intervention. When the wildwood returns to west Wales, perhaps wild bovine, or replacements such as Black Welsh or Highland cattle, can be restored to our landscape, continuing the legend of their lost kin, carrying their memory beyond an ancient horn buried for centuries unseen, unknown, deep in the ground.